1 of 4 Bring a large pot of salted water to a boil. Add spaghetti and cook until al dente, 9 minutes. Drain, reserving 1/2 cup of the cooking liquid. 2 of 4 Put pesto in a large bowl. Scoop avocado flesh into bowl and mash avocado and lemon juice into pesto. 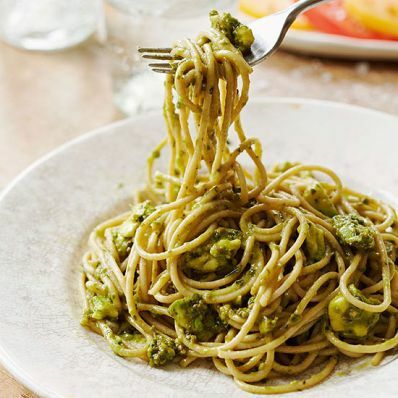 3 of 4 Toss spaghetti with pesto, adding some of the reserved cooking liquid if necessary to give it the desired consistency. 4 of 4 Serve spaghetti with sliced tomatoes. Per Serving: 61 g carb., 10 g fiber, 14 g pro., 321 mg sodium, 22 g Fat, total, 7 mg chol., 4 g sat. fat, 483 kcal cal.